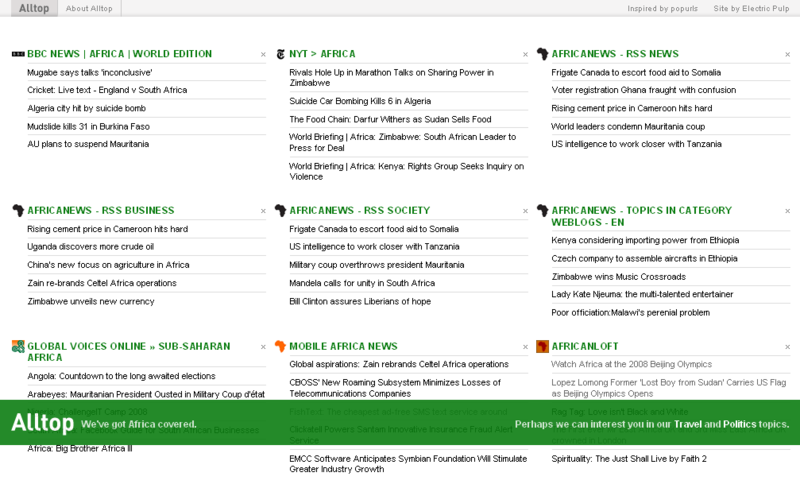 Introducing the latest addition to Guy Kawasaki‘s news aggregation service Africa.Alltop.com . Alltop is a popular news and blog aggregator for various topics around the web. With the addition of Africa.Alltop Guy has given African technophiles a well deserved show of support and highlighted a continent in much need of some positive PR – see Afromusings article on the Meme’s. Markets and Africa. I have had the good fortune of working closely with a number of bloggers featured on Alltop’s Africa page and can confidently say that these men and women are positively changing the perception of Africa. They belong to an ever growing breed of confident Africans that believe strongly in the need for dialogue, self-reliance and positive change. Thanks to Guy Kawasaki, Ellen Leanse, Erik Hersman (see Erik’s blog for the back story on Africa.Alltop) and all those people working behind the scenes to bring this vision to fruition. Be sure to join the conversation on Africa and watch Alltop.Africa.